After their ninth-inning comeback rally on Thursday, the Reds took hold of the series. They got some superb pitching from Travis Wood on Saturday, and then some solid work from Bronson Arroyo on Sunday. Moving the Needle: Brandon Phillips‘s three-run shot, +.214 WPA. Of course, Ramon Hernandez’s walk-off bomb was the biggest WPA gain of the series, but we covered that one already. Before Sunday’s game was a blowout, the Reds had a 3-2 lead in the fourth, but it wouldn’t stay that way for long. Randy Wolf, as he does from time to time, put one on a tee for Phillips, who hit a high, arcing bomb to left field, plating three runs and blowing the game open. 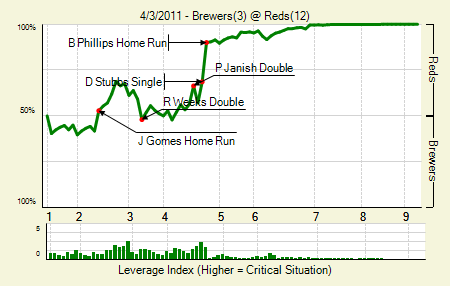 The only other run the Brewers scored was a Ryan Braun homer. Rickie Weeks also homered. In fact, a lot of other people also homered, all around the league. Also in this issue: Dodgers over Giants, Braves over Nationals, Padres over Cardinals, Pirates over Cubs, Diamondbacks and Rockies split, Mets over Marlins, Phillies over Astros. We had three close games and a blowout. It just so happens that the loser of the close games won the blowout. Moving the Needle: Brandon Belt’s first major league homer, +.312 WPA. We were waiting for it all weekend. Brandon Belt, hyped rookie, facing the Dodgers, hated rivals. 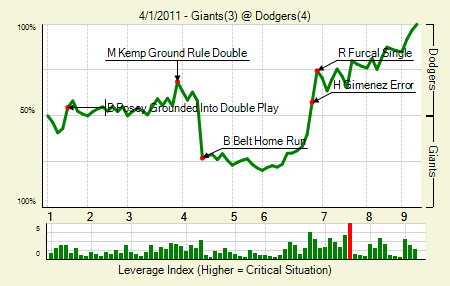 Chad Billingsley made only one mistake, and it was on a 2-0 pitch to Belt. He drove it over the center field wall, driving in three and putting his team up by two. The lead would last only two more innings, as the Dodgers pulled ahead in the sixth. Thursday’s game might have been a yawner, with the Braves scoring one in the first and one in the second, followed by no scoring the rest of the game. The other two games this weekend were far more interesting, if only because 1) the Nats picked up a win, and 2) we saw an offensive display on Sunday. Moving the Needle: Rick Ankiel creates separation with a two-run homer, +.180 WPA. The WPA needle didn’t move that drastically in this weekend series. The most significant swing came off the bat of Ankiel. It appeared to be a hit-and-run, with Ryan Zimmerman taking off from first. But Tommy Hanson left the ball over the middle of the plate, and Ankiel crushed it over the right field wall, giving the Nats a 4-1 lead, one from which they would not look back. Despite Albert Puhols’s first homer of the year, the Cardinals had no shot on Saturday. They came back on Sunday, though. Jaime Garcia pitched the first complete game shutout of the year, which more than compensated for the Cardinals’ lack of scoring. They’ll miss Wainwright, but Garcia might help soften the blow. 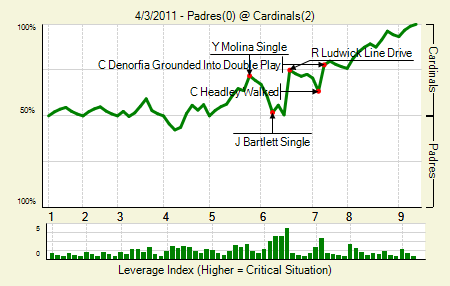 Moving the Needle: Ryan Ludwick fails with the bases loaded, -.244 WPA. Despite Garcia’s brilliance, the Padres had a shot on Sunday. They loaded the bases with just one out in the sixth, but it took only one swing to kill the rally. Ludwick smashed the ball down the third base line, but Daniel Descalso was right there. He caught it and then beat Dustin Moseley back to the base, doubling him up, erasing the best chance the Friars had. Ups to Moseley, though, for pitching a quality game; he allowed no extra base hits. The Cubs made some big moves this winter with their eyes on the NL Central title. One weekend series doesn’t alter their chances, but damn, it bruises the ego a bit to drop two to the Pirates. 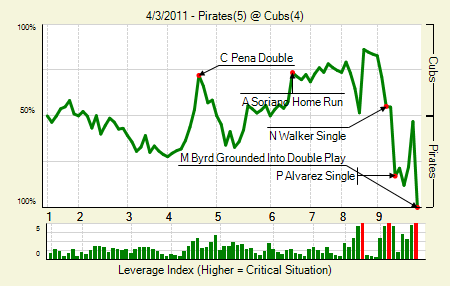 Moving the Needle: Marlon Byrd grounds into a double play to end the game, -.469 WPA. I thought that Neil Walker’s grand slam would win this easily, since was worth +.422 WPA. But game-ending double plays when you’re down by one run tend to hurt a lot, which is what Byrd did when he had runners on first and third with one out in the ninth- Cedeno to Walker to Overbay. They might not be singing that in Pittsburgh for long, but on Sunday it worked well enough. We had our first postponement this weekend, with Sunday’s game getting cancelled. That’s OK, though. The D’Backs and the Rockies played two quality games over the weekend (even though Friday was a bit tedious). Moving the Needle: The Justin Upton turns a deficit into a lead with a three-run blast, +.322 WPA. Ubaldo Jimenez’s fastball was straight and true. Upton feasts on those. This one was inside at 93 mph, and Upton turned on it. He ran out of the box with some hustle, but he didn’t need to; the ball cleared the wall and then some, giving the Diamondbacks a 4-3 lead. 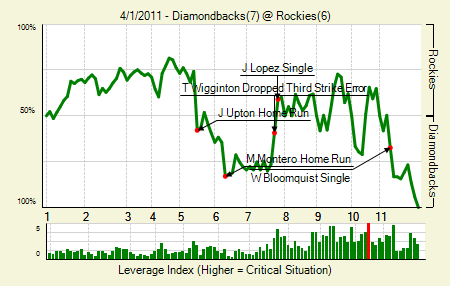 The Rockies would battle back, but the Diamondbacks eventually took the game in 11 innings. It felt as though the two extras took another two hours. With 15 runs in the final two games of the series, the Mets didn’t have much trouble taking this one. Moving the Needle: Greg Dobbs ties it in the ninth, +.437 WPA. Saturday night was the clear highlight of this series. The two teams were tied at two heading into the ninth, when the Mets took the lead on a Josh Thole single. But then Francisco Rodriguez blew the save when Dobbs singled in Brett Hayes. That also put the winning run on third, but the Marlins couldn’t bring him home. 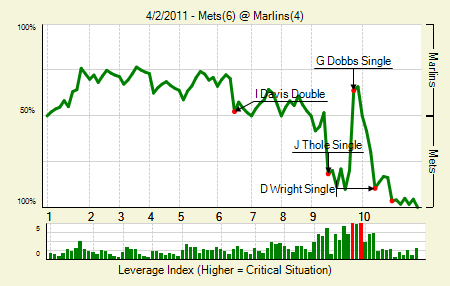 They paid the next inning when David Wright hit a go-ahead, two-run double that finished off the Marlins. It appeared as though Houston had Friday’s game in the bag. But never trust that Houston bullpen. 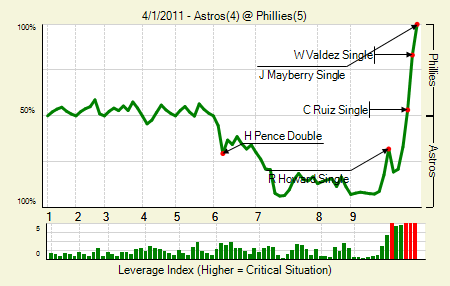 They blew it, and then the entire Houston pitching staff bombed the weekend, allowing 16 runs in the final two games. Moving the Needle: Wilson Valdez ties it with a single, +.300. 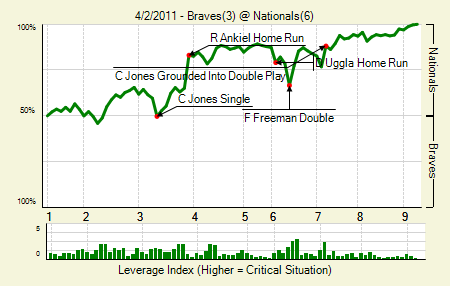 This is the second instance in The Morning After where a non-walk-off hit in a walk-off game was the biggest swing. Apparently, after Wilson Valdez hit his game-tying single in the bottom of the ninth on Friday, the game was all but over. That left the game tied, with the bases loaded and just one out. John Mayberry, who won the game with a single of his own, gained only .168 WPA, which might not even rank in the top 20 all weekend. We hoped you liked reading The Morning After: Weekend No. 1, NL Edition by Joe Pawlikowski! Last graph needs to be changed.